Women with a BRCA mutation face a complex choice between breast cancer surveillance and prophylactic mastectomy. We determined risk management preferences shortly after genetic test disclosure and mastectomy status after a median observation period of 2 years. The effect of an educational-support group on the realisation of risk management preference was explored. We included 163 newly disclosed BRCA mutation carriers with no history of cancer, whose breast cancer risk management preferences were recorded. All carriers were offered the opportunity to participate an educational-support group. Mastectomy status was checked after a median observation period of 2 years. Of the total sample, 27% had an initial preference for mastectomy and 48% attended an educational-support group. After a median observation period of 2 years, 30% of the total sample had undergone prophylactic mastectomy. 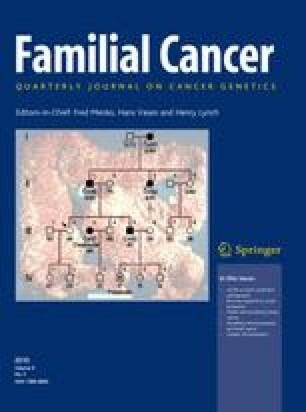 Of the women with a preference for surveillance, 90% of educational-support group attendees and 88% of the other mutation carriers, were still under surveillance. The number of women with a preference for mastectomy who actually had a mastectomy performed, was significantly higher in the group that attended an educational-support group as compared to those who did not, 89% and 63% respectively (OR 4.8, P = 0.04). Strong predictors for prophylactic mastectomy within 2 years were younger age and prior preference for mastectomy (R 2 = 0.57). Nearly all BRCA mutation carriers proceed with their initial choice for surveillance or prophylactic mastectomy. The study provides presumptive evidence that educational-support group participants decide to undergo prophylactic mastectomy earlier than non-attendees.